The tiny organisms that travel along the ocean currents and drift along in bodies of fresh water are known as plankton, which comes from a Greek word meaning "drifter" or "wanderer." The two main categories of plankton are zooplankton and phytoplankton. Although they are similar in size, inhabit the same bodies of water and are both essential to the marine ecosystem, the two types of organisms each have their own defining characteristics. The most significant difference between zooplankton and phytoplankton is that zooplankton are protozoans and animals, whereas phytoplankton are photosynthetic organisms, including algae (protists), blue-green algae or cyanobacteria (bacteria), and organisms such as dinoflagellates, which do not fit neatly into a single group. The most common phytoplankton are diatoms, photosynthesizing dinoflagellates, and blue-green algae. Zooplankton include protozoans such as foraminiferans, radiolarians, and non-photosynthesizing dinoflagellates as well as animals like tiny fish and crustaceans such as krill. As phytoplankton are plants, they obtain their energy through the conversion of sunlight in photosynthesis and pull nutrients from the water around them. Zooplankton generally feed upon other plankton, including phytoplankton and zooplankton, along with bacteria and various types of particulate plant matter. Phytoplankton are the primary food source for the zooplankton. Because phytoplankton depend on the sun for their food, they tend to live near the surface of the water where there is plenty of sun. Zooplankton, on the other hand, often remain in the deeper parts of the water where there is little sunlight and travel to the surface during the night to feed. Both forms of plankton can be found in oceans around the world and in many bodies of fresh water such as lakes and ponds. Plankton are the basic food source for a variety of marine species, from tiny fish larvae such as cod all the way up to giant baleen whales. Both zooplankton and phytoplankton not only play a vital role in the stability of the marine ecosystem, but they also serve as an indicator of water health, since they are affected by slight changes in the environment. Changes in temperature or acidity or an increase in nutrients from farm runoff and pollution can all have dramatic effects on plankton. Often, changes in plankton can reveal early warning signs of a problem in the environment. One sign of imbalance is termed a red tide. Red tides, also known as harmful algae blooms, are an overgrowth of algae, a type of phytoplankton, that can cover the surface of the water. In severe cases, the massive overgrowth of the algae can release sufficient toxins to cause a die-off of fish and marine animals in the area, creating what is known as a dead zone in the water. Phytoplankton, which release oxygen through photosynthesis, are responsible for producing half of the world's oxygen. As well as forming the basis of marine food chains, these tiny organisms safeguard the Earth's atmosphere. Niki Fears has been a writer and editor for more than four years and has written for a number of major sites. She specializes in natural health, nutrition, herbalism, environment, religion and spirituality, traditional medicine, culture, folklore and myth, and alternative news. Fears, Niki. "Zooplankton Vs. 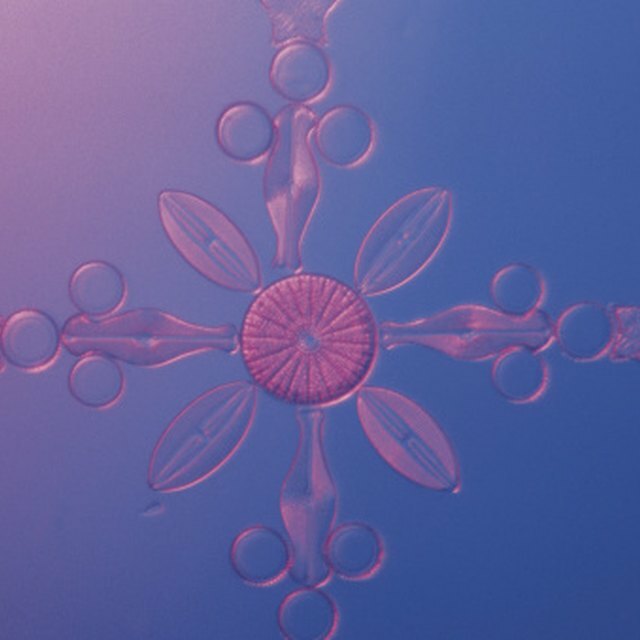 Phytoplankton." Sciencing, https://sciencing.com/zooplankton-vs-phytoplankton-5432413.html. 13 March 2018.